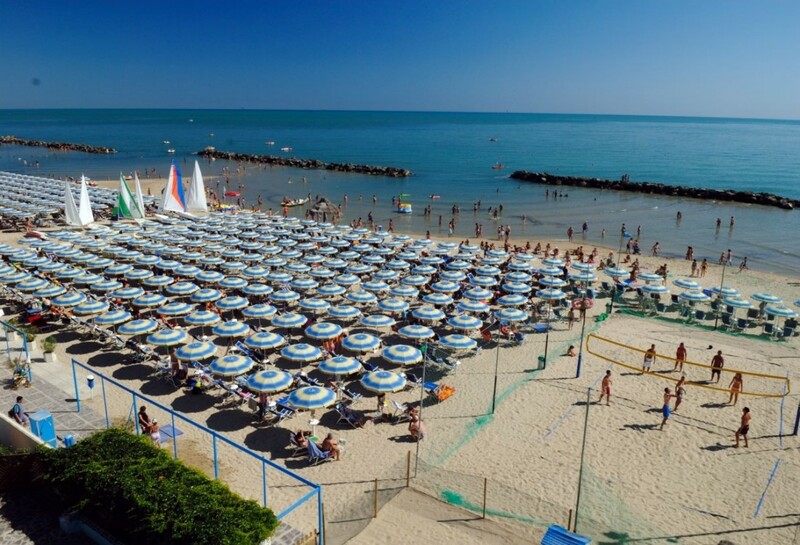 Four-star touristic village in Montesilvano, located directly on the beach. 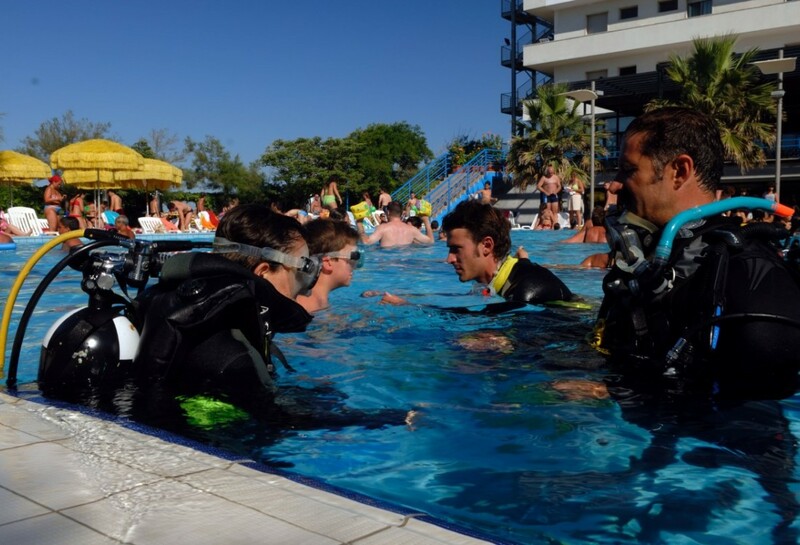 The Serena Majestic offers services that satisfy the needs for fun and relax of adults and children. The structure consists of 200 room with sea view, completely renewed in the 2011. The private sandy beach is equipped with reserved umbrellas, sunbeds, dressing rooms, showers, bar, info point. 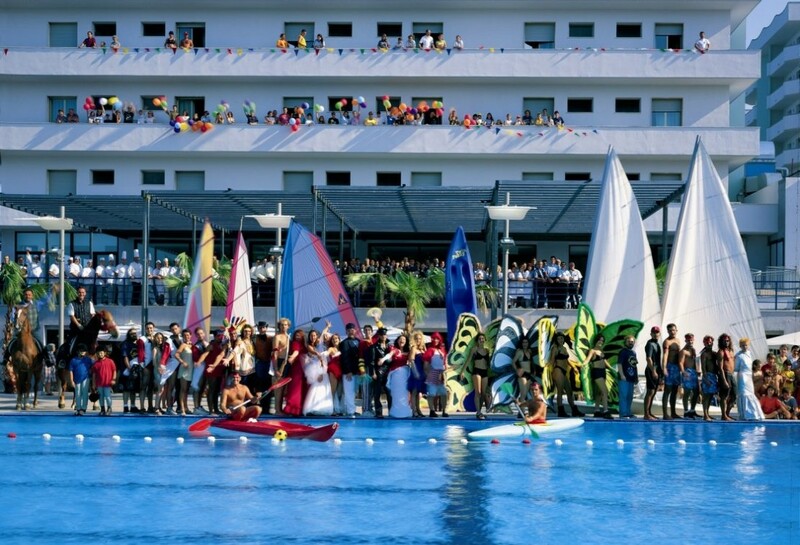 There are also sail boats (except during the hours of the group lessons), windsurfs and canoes, paddle boats and a beach volley field. 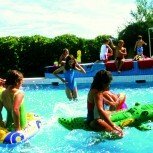 The Serena Majestic offers one of the best entertaining service in Italy, with more than 40 professional entertainers at the service of both adults and children: parties, shows, games, sports lessons and tournaments, live music and dances, excursions. 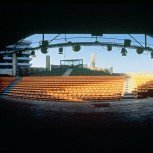 Shows every evening in the big amphitheatre: musical, cabaret, variety shows, games. 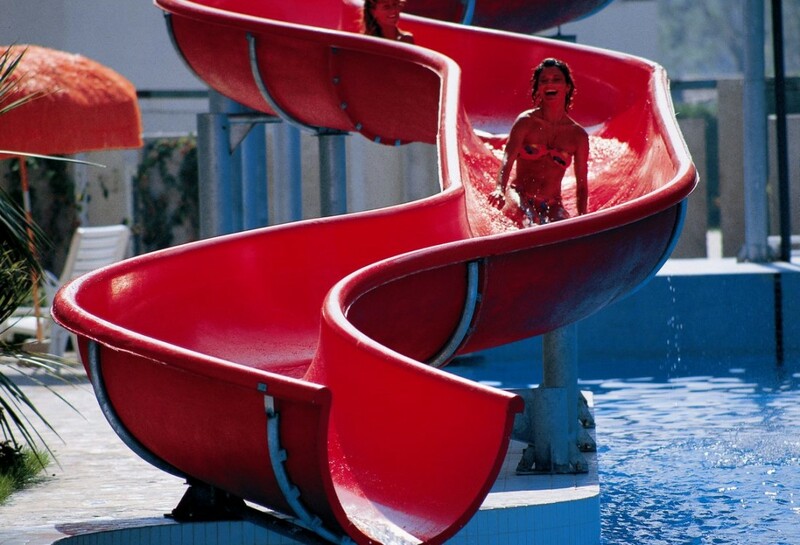 There is a big pool with waterslides for the families and also a swimming pool, a playground for the children with swings, slides and much more, and also an exclusive kitchen open 24/7 for the parents who want to cook for their babies. 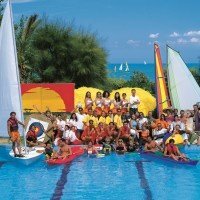 In the Serenino Club, SereninoPiù Club, Serenup and Serenhappy the children can be entrusted to highly-qualified entertainers who organize a wide program of activities. The entire family will have fun with the Bluserena Circus, where they can learn the basis of the circus performances. For the fitness lover, there is a modern gym with isotonic machines and group courses, muscular awakening in the morning, Stretch and Tone, Total Body and water aerobics, Acqua Boxe, Nordic Walking and Pilates. 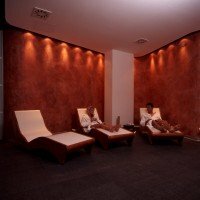 The Bluewellness is the perfect area for those who want to relax with facial and body treatments, relaxing massages and customized wellness itineraries. 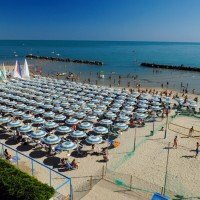 The stays in Abruzzo allow the tourists to enjoy the sea, the mountain, the art, the history and the traditions of the region. An uncontaminated land, unique in Italy for its variety of fauna and flora, which are protected in the three national parks, regional parks and many natural reserves (Abruzzo is referred to as the "Regione Verde d'Europa", the green region of Europe). "Pescara vecchia", between corso Manthonè and Via delle Caserme, is the main core of the city during every season. Walking in these streets, full of typical restaurants and clubs open until late night, the Museo Casa Natale G. d'Annunzio can be found. Records of the poet's life and art are collected there. There is also the Museo delle Genti d'Abruzzo, which contains a great part of historcal documents and local traditions from the origins to the 1950s. In the modern center of Pescara, near the famous Piazza Salotto, Villa Urania - Antiche Maioliche di Castelli is located. It is a museum in a nineteenth-century villa, where one of the most important (in the entire world) collections of Castelli's artistic pottery is exhibited. Città Sant'Angelo, is 11 kilometres far from the hotel. Here it is possible to admire the Collegiata di San Michele, dated back to the twelfth century, the curch of S. Chiara and the church of S. Francesco. 20 kilometres from here there is Atri, full of artistic buildings: Palazzo Acquaviva, the Teatro Comunale, the church of S. Agostino, the Fontana Canale of the fourteenth century and le Grotte, a system of interconnected caverns. Chiest is located on a hill that divides the waters of the Pescara river and the waters of the Alento basin. It also divides the Gran Sasso and the Maiella from the Adriatic plains, offering a great variety on unique landscapes. It is one of the most ancient cities in Italy and it has mythical origins. The Museo nazionale Archeologico in Chieti collects the traces of the most important steps in the archeological history of Abruzzo, like the statue of the Guerriro di Capestrano (VI century B.C. ), while the Museo della Civitella preserves evidences from the paleolithic and neolithic age. Vasto rises on a hill that slowly slopes down to the sea. It is full of history: remainings of villas from the Augustus age and traces of medieval establishments; the Castello Caldoresco built during the first half of the fifteenth century; the Palazzo d'Avolos, located in Piazza Prudente and built on the ruins of a fourteenth-century structure, from which it inherited many decorative details. On the coast, the "Trabocchi" can be admired, typical wooden structures used for fishing in ancient times. The Isole Tremiti. The archipelago consists of three islands: San Dominio, San Nicola and Caprara. 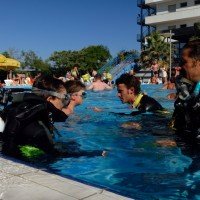 The sea is crystal clear and its bottom is rocky, which makes it an ideal spot for cuba divers. Here, tourists can rent rafts and boats to discover the numerous typical caves and inlets. Lago di Penne is one of the most interesting oasis for the fauna of the region. 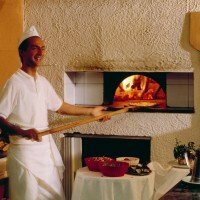 Inside the oasis it is possible to visit the Masseria dell'Oasi, where biological farming is practised, and the Laboratorio dell'Oasi, where clients of all ages can perform typical local activities, such as wood and ceramic production. The Gran Sasso National Park extends for 160.000 hectars. The fauna and flora of the park are various and the fauna includes rare species: the Appennine wolf, the wildcat, the chamois, the wild boar, squirrels and foxes. In the Park there is a net of paths for the excursions and the Ippovia del Gran Sasso is also accessible with mountain bike. The territory is full of well-preserved medieval villages, rural architectures, castles and abbeys. The Parco Nazionale della Majella extends over the cities of L'Aquila, Chieti and Pescara and other 34 municipalities. The Park consists of a calcareous ground in the canyon of Orfento, Selva Romana, Santo Spirito and Val Serveria. The Majella has its highest peak in the Monte Amaro, 2.793 meters on the sea level. Its fauna is various and full of rare species such as the Appennine wolf, the wildcat and the chamois. The Park organizes trekking, exscursions with mountain bike or horse, birdwatching, climbing and rafting. The Parco Regionale del Velino Sirente is a wonderful and uncontaminated natural landscape with one of the most important flora and fauna of the middle of Italy. The calcareous massif of Velino and Sirente are characterized by karstic expanses and rocky walls, by the Gole di Celano and San Veneziano and by the Grotte di Stiffe. 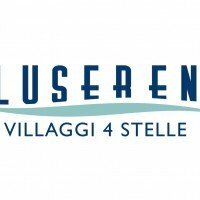 The Parco del Velino Sirente organizes numerous activities for its visitors: trekking, excursions with mountain bike and night excursions, to fully enjoy an entire day in close contact with nature. The Parco nazionale d'Abruzzo offers numerous ways to live a genuine and simple relationship with nature, culture, traditions and its typical landscapes, from the delicate hills to the Appennine slopes. Species such as the black bear, the chamois and the wolf can be admired. The Park offers to its visitors professional guides that will take them to the most beautiful and quiet places, discovering the wild side of the Park through trekking and excursions with mountain bike. There are also many structures where local gastronomy can be appreciated. Check-in from 16:00 - Check-out within 10:00. 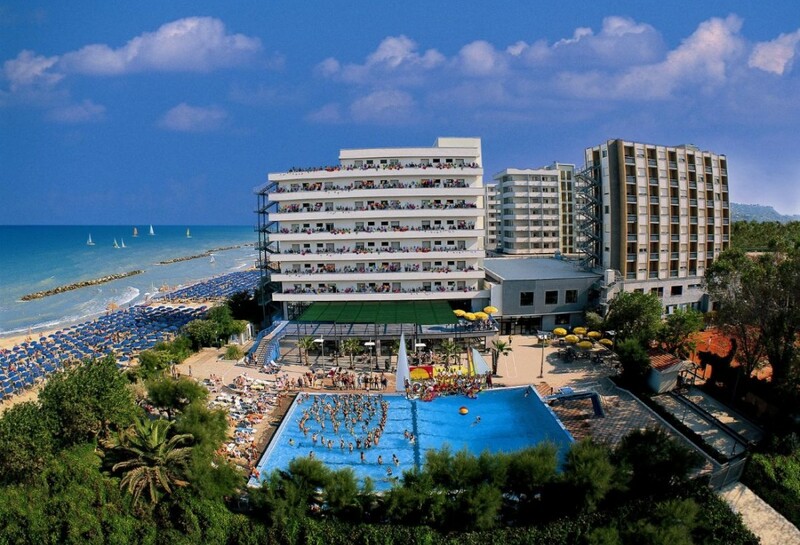 Late Check-out until 14:15 for room and beach (additional cost). Smart Card, rechargeable prepaid card that can be used to pay in bars and restaurants. 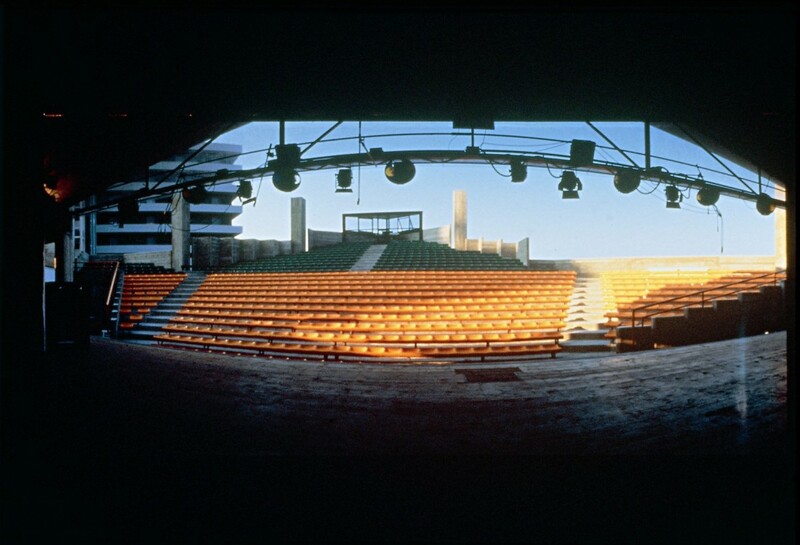 Shows every evening in the amphitheater, from musical to cabaret, from comedy to variety shows. Card games, with tournaments of Scala Quaranta, Poker Texas Hold'em, Burraco, Briscola and Scopone. Medical office open in preset hours, in the morning and in the afternoon. Free appointments. Doctor available 24/7 in the village (pediatrician from 17/06 to 08/09). A multi-puropose basketball/tennis court, a five-a-side football field with artificial grass. Wi-Fi connection in the common areas and in the Comfort rooms. 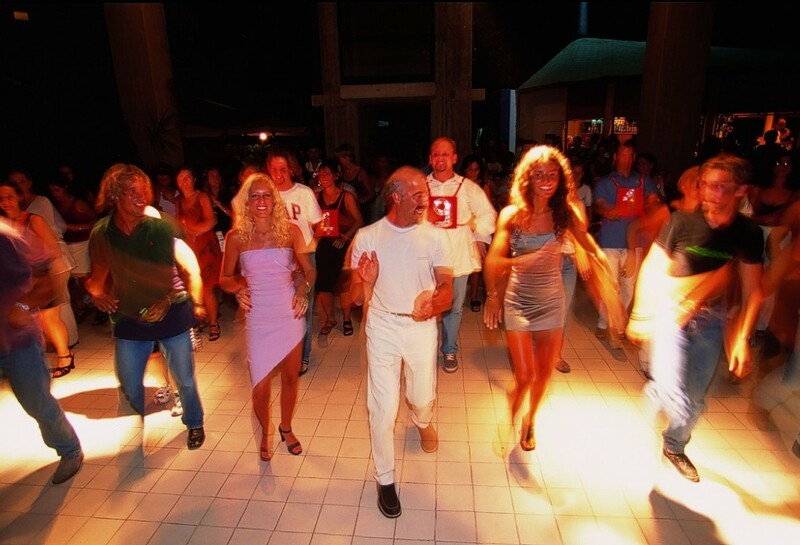 Dancing lessons: Salsa, Merengue, Bachata, group dances and Liscio. 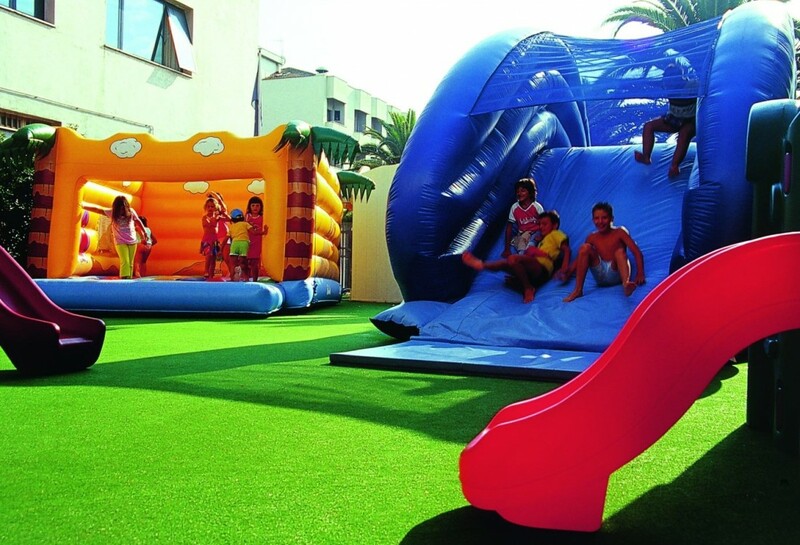 Fenced playground with slides, swings and other fun activities. Muscular awakening "Stretch and Tone", sailboating group lessons. 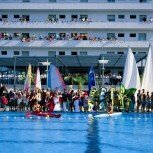 Sport tournaments, water aerobics and group dances on the beach. Two tennis courts, bocce court with artificial grass. 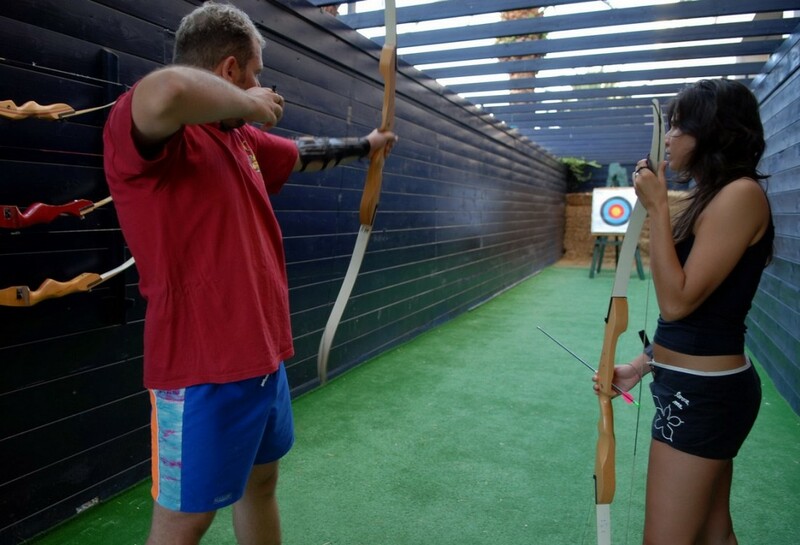 Beach volley, ping-pong, Dive Center and archery. 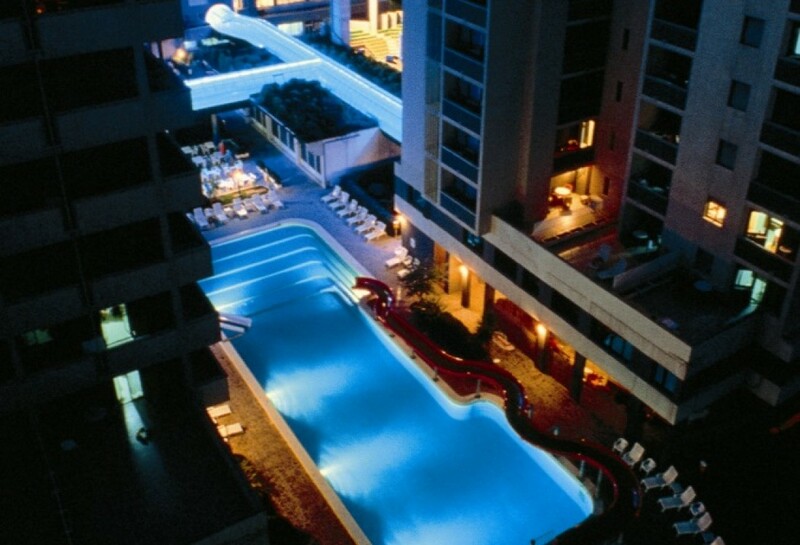 Freshwater pool with diving boards. 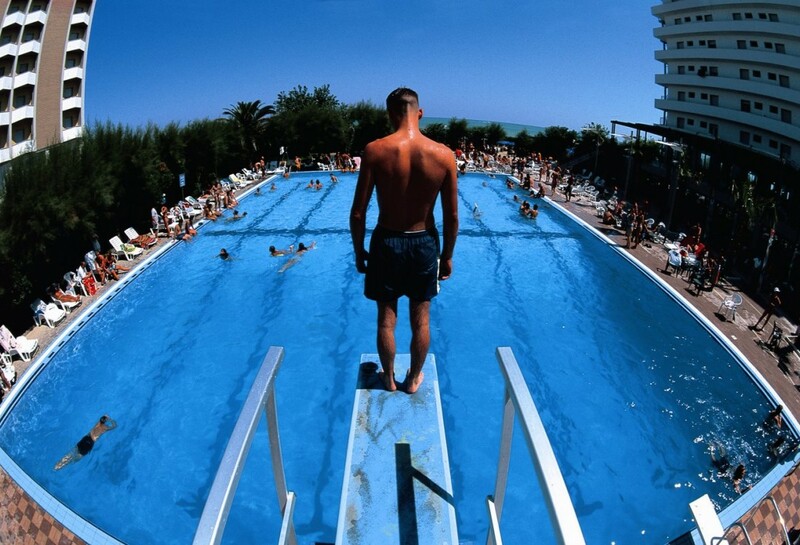 Mandatory for guests older than 3 years, it entitles the owner to use the sports facilities, the beach services, to participate in tournaments and group lessons, to use the Serenino, SereninoPiù Club, Serenup and Serenhappy services. 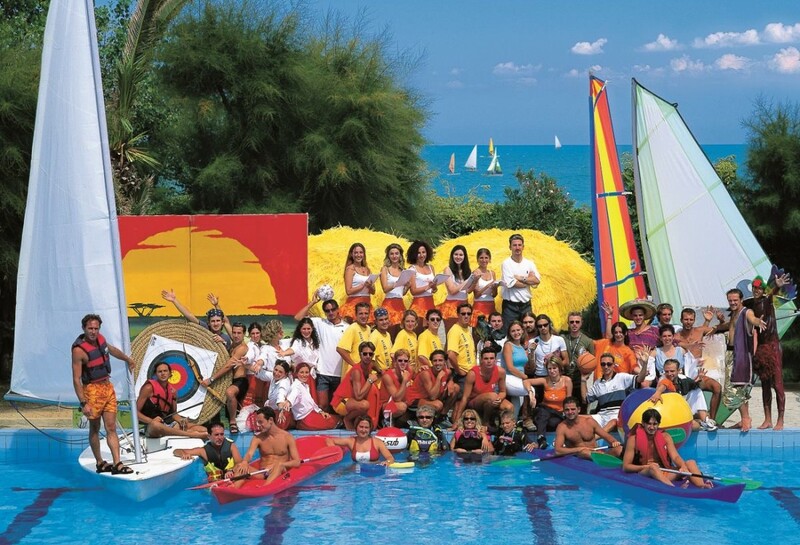 At the GranSerena work over 40 entertainers ready to amuse the guests of any age, both adults and children, with parties, shows, sports courses and tournaments, live music and dancing, excursions. Shows in the amphitheater every evening: musical, cabaret, variety shows, games. 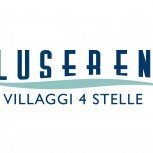 The Bluserena villages are the first in Italy with the quality mark "VACANZA AMICA DEI BAMBINI", child-friendly holiday, recognized by the National Federation of Pediatricians Cipe-Sispe-Sinspe. 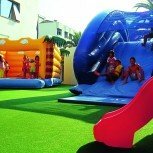 All services, comforts and structures are designed to be used by children, teenagers and adults, fun and safe and always controlled. 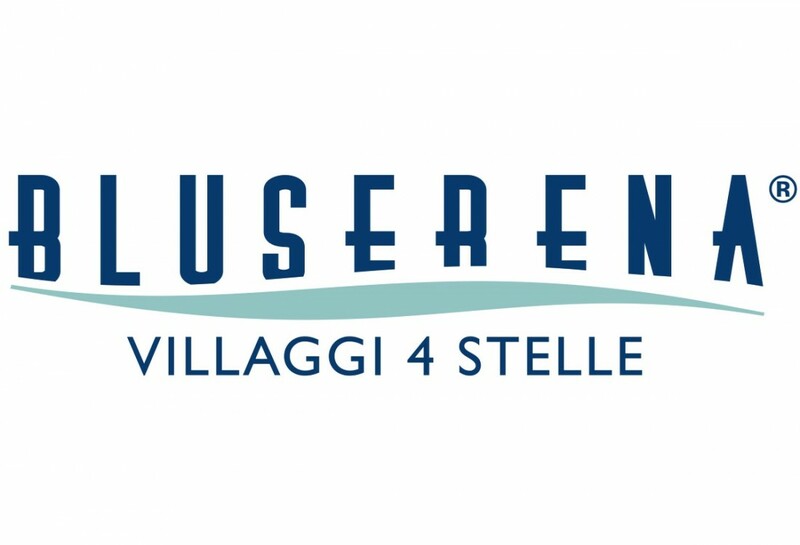 In the Serenino Club, SereninoPiù Club, Serenup and Serenhappy, the children can be entrusted to highly-qualified professional entertainers who will present a various program of activities. 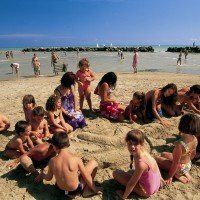 All the listed services are available from 04/06 to 08/09, except for the Serenino and the SereninoPiù Club, which are available for the entire summer season. 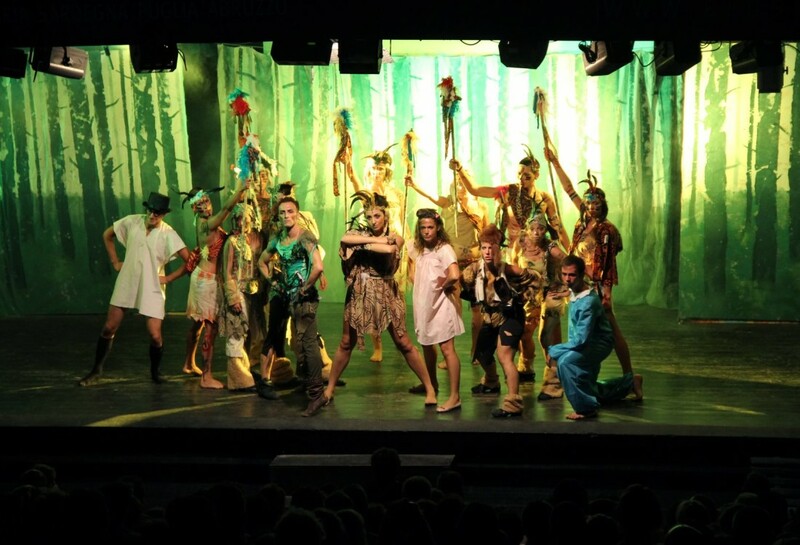 The teenagers can also participate in the Serenup and Serenhappy activities such as theatre, sports, games and much more. All the family will have fun with the Bluserena Circus, learning the basis of circus performances. Car rental and transfer service. Fenced and non-supervised car parks. Wheelchair rental for disabled guests. Bike rental (bikes cannot be used in the village). Medical appointments out of the preset hours and outside the medical office. 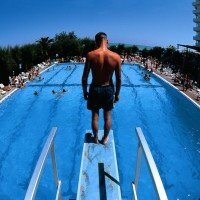 Services and treatments in thermal center and in the Bluwellness (surcharge). The Serena Majestic offers two air-conditioned dining rooms and a high-quality rich and various buffet service (breakfast included) and show cooking with at least 25 courses: hot and cold appetizers, first and second dishes, numerous side dishes, grilled meat and fish, dessert, fresh fruit, wine in carafes and filtered water included during the meals; a selection of bottled local wines and other beverages are available paying an extra cost with the smart card. The guests can also benefit of a packed lunch cooked for them on request, instead of a meal. 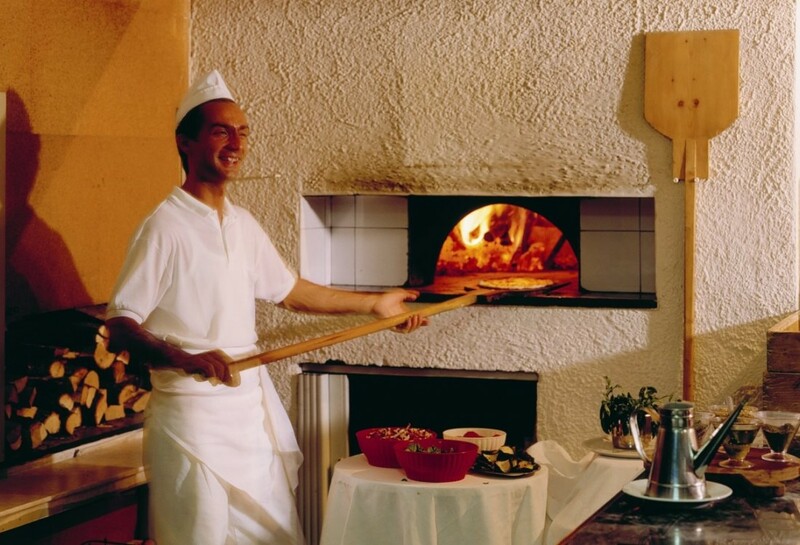 Inside the restaurant there is the Gulliver pizzeria, which carries out a take away service in preset hours. The mom's kitchen is free and open 24/7 for the guest who choose the full board or the half board, and the ingredients are available during the hours of the main meals. 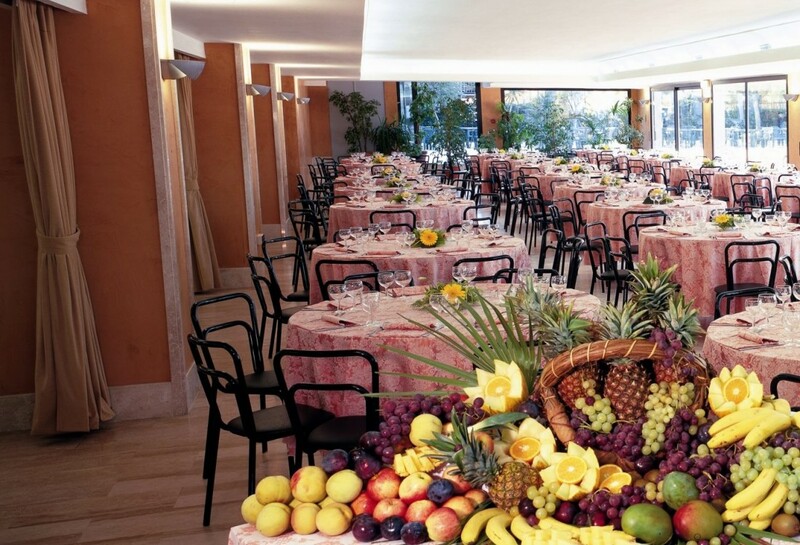 The main restaurant offers a buffet service at breakfast (coffee from dispenser), lunch and dinner (with show cooking), wine in carafes and filtered water, a reserved table for the entire week with 8/9 seats, often shared with other guests. 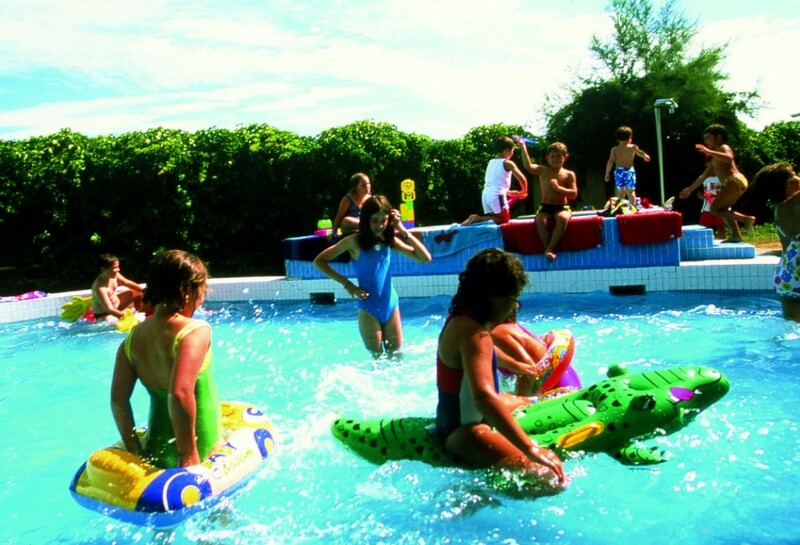 Lunch is reserved for the children of the Mini Club and the teenagers of the Teeny and Junior Club from 04/06 to 15/09. The bars offer filtered water. 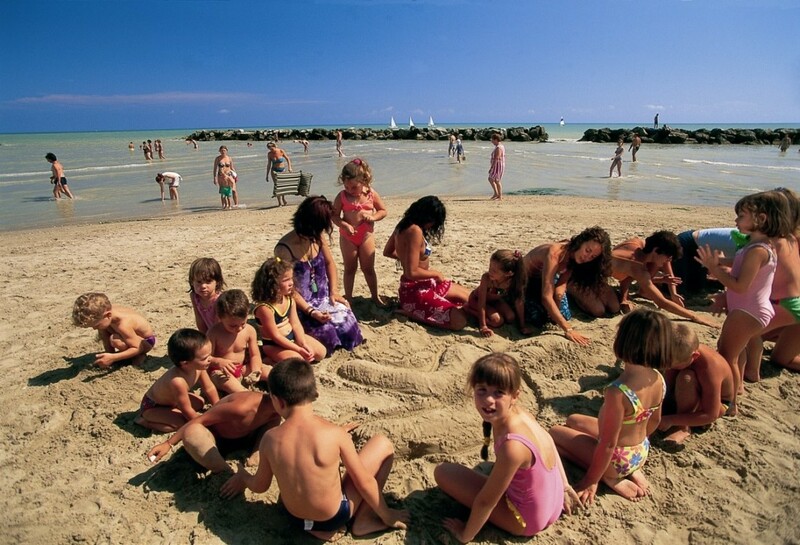 The beach offers a reserved umbrella, a sunbed and a beach chair for each family. The kitchen offers a space for the parents who want to cook for their babies, open 24/7, with assistance and ingredients avaiable during the hours of the main meals. For drinks with an extra costs the smart card must be used. It includes drinks until 14:00 of the day of the departure. The main bars offer espresso and cappuccino, decaffeinated and barley coffee, cappuccino with soy milk, white milk, macchiato, ginseng, american coffee, coffee with a splash of liquor, coffee cream, tea and infusions; beverages on tap in 20cl glasses: iced lemon or peach tea, lemonade, tonic water, cedrata, chinotto, orange juice and coca-cola (or pepsi); fruit juices (pineapple, ace, peach, apricot, red orange, pear), black cherry syrups, almond milk, mint and barley coffee), mineral water, draft beer in 20cl glasses, white wine, red wine, prosecco, liqueur, tonic liquor, vermouth, cocktails and grappa. 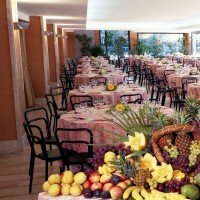 All the cocktails, champagne and the alcoholic drinks (grappa, liqueurs and prosecco) marked as "special" on the menu are not included. The bars of the main restaurant offer espresso and cappuccino, decaffeinated and barley coffee, cappuccino with soy milk, white milk and macchiato; at lunch and dinner a beverage on tap in a 40cl glass for each person older than 3 years choosing among beer, orange juice and coca-cola (or pepsi). It also includes the possibility to rent one beach towel for each person older than 12 years, that can be changed after the first week (further washes are not free). To have access to the services it is mandatory to use the Smart Card and to wear the specific bracelet. The All Inclusive formula cannot be used to offer drinks to third parties. The formula can be revoked by the client himself at any moment, and by Bluserena if the rules are not followed by the client. 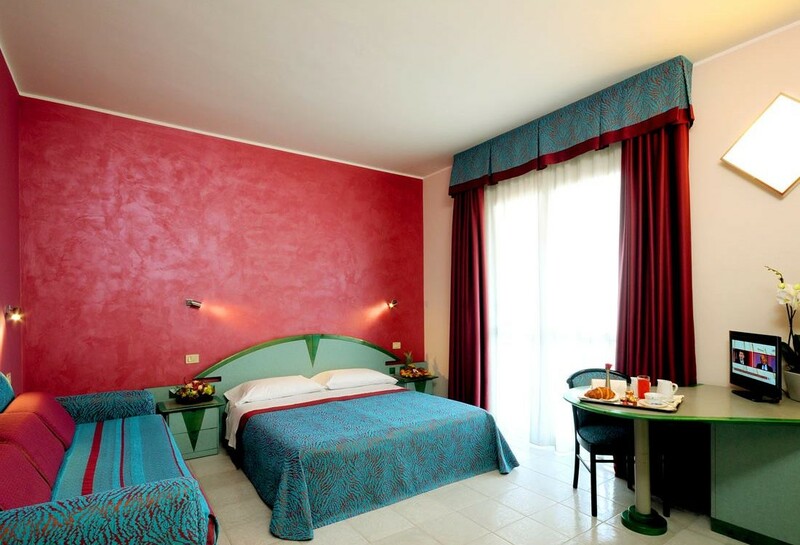 In both cases, the guest will benefit of the Soft All Inclusive offer. 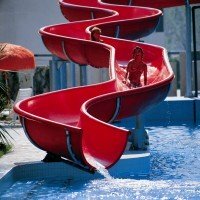 Tips and everything that is not explicitly listed. Room with sea view € 7,00 a day for each room. 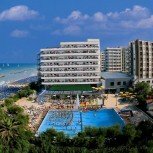 Mandatory club card (for guests oder than 3 years) € 36,00 per person for the entire stay. Late check-out: the room and the umbrella on the beach are available until 14:15 of the day of the departure, € 49,00. For those who choose the late check-out, the extra meal in Soft All Inclusive costs € 22,00; it's free for children 0-3 years; € 14,00 3-12 years; packed lunch € 7,00 per person. Umbrella in the first row € 16,00 a day until 28/07 and from 26/08; € 19,00 a day from 29/07 to 25/08. Umbrella in the second row € 11,00 a day. Umbrella in the third row € 6,00 a day. 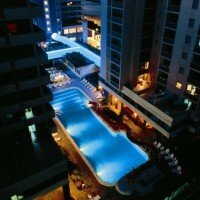 The second sunbed (instead of the beach chair) must be requested during the booking, subject to availability, € 7,00 a day. (The first sunbed is included in the offer). Beach towel rental € 4,50 a week, additional cost required for extra washing. Stroller rental € 7,00 a day, € 29,00 for one week, € 49,00 for two weeks. Serenella kit for children: a big Serenella Peluche (50 cm), a Serenella single-bed cover 100% cotton with piquè knitting 260x170 cm, a Serenella Bio Bath kit (shampoo, shower gel, body lotion in 100 ml bottles) and a Serenella Sticker. Each kit must be reserved during the booking and costs € 49,00. Free third bed for children 3-8 years. -50% fourth bed for children 3-8 years. -50% third and fourth bed for kids 8-18 years. -20% third and fourth bed for adults. Free cradle for babies 0-3 years and mom's kitchen/baby-bottle area included. SPECIAL ADULT + CHILD: reductions for children in the second bed: from 27/05 to 24/06 and from 9/09 to 16/09 -70% 0-3 years; -60% 3-18 years. From 24/06 to 09/09 -40% 0-3 years, -30% 3-18 years. Possible reductions and additional costs might be subject to variation and they will appear on the "Book" page.